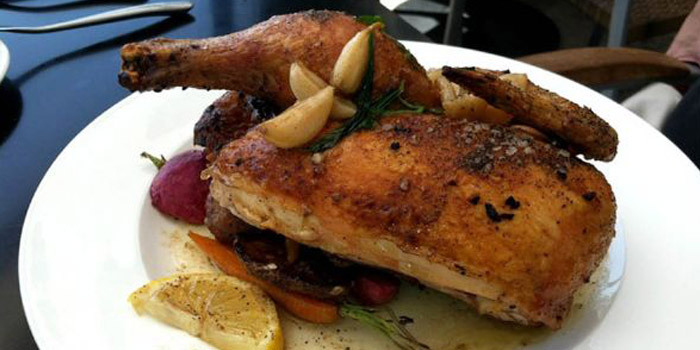 Roasting a chicken is easy and yields delicious results, a perfect comfort food. Take the extra ten minutes marinating the chicken properly, it’ll be worth the extra effort. Use an organic chicken if possible, they are not only raised humanely, under strict guidelines, but they taste better In the end, the chicken will eat well w/ about anything from a green salad and baguette to grilled vegetables to a creamy risotto, there’s no shortage of combinations. Take chicken and rinse under cold running water, pat dry and place in a roasting pan . Pierce the inside of each thigh w/ the tip of a knife, then stud a clove of garlic into the hole. Place the cut lemon, the remaining garlic, and ¾ of the herbs, stems can be intact, into the cavity of the chicken. Also season the cavity w/ salt and pepper. Chop the remaining herbs; incorporate the herbs w/ the butter, olive oil, salt and pepper, then rub the outside of the chicken w/ the mixture.Truss the chicken to ensure that the bird cooks evenly. Roast in a preheated oven at 375 degrees until the chicken is cooked, 165 degrees internal temperature. Could take between 50 minutes to a little over an hour. The cooking time depends on the size of the chicken and your style of oven. As the chicken is cooking, continually baste the bird, w/ the pan drippings. After the chicken is cooked, place on a platter to let rest for about 7-8 minutes. For a quick sauce, deglaze the roasting pan w/ a splash of the wine you are drinking and 2 cups of chicken broth or water. Scrape the bottom of the roasting pan w/ a spoon to loosen all of the caramelized goodness and reduce by half.. Spoon over the chicken after it is carved.